The rugged hills and undulating plains of Samburu and Shaba National Reserves in Kenya offer the quintessential safari experience. Here, the iconic acacia trees are plentiful and provide sustenance for giraffes, elephants and a long-necked gazelles called gerenuks. Euphorbias (the Eastern Hemisphere’s answer to the cactus) also dot the landscape. There’s nothing like watching a giraffe towering over trees in the wild. Photo taken on an Ujuzi safari in Kenya. 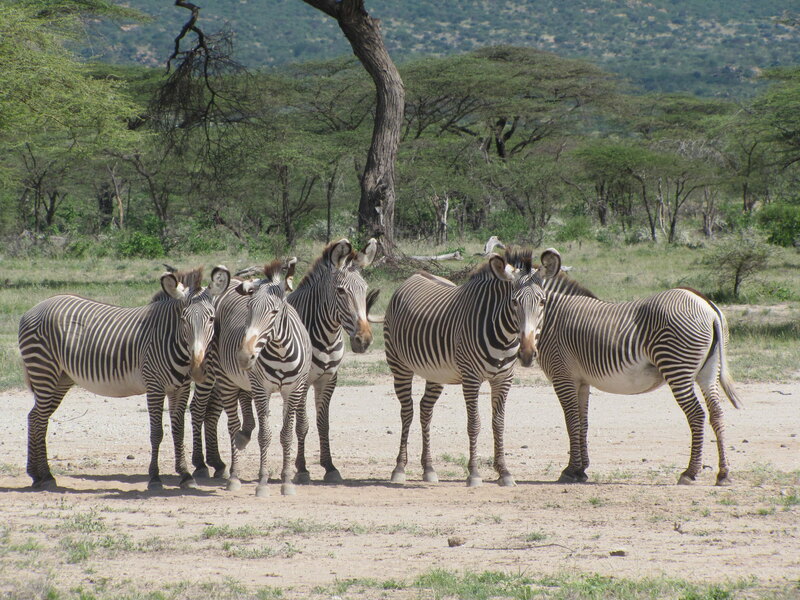 Intricately striped Grevy’s zebras enjoy the morning sun at Shaba National Reserve. 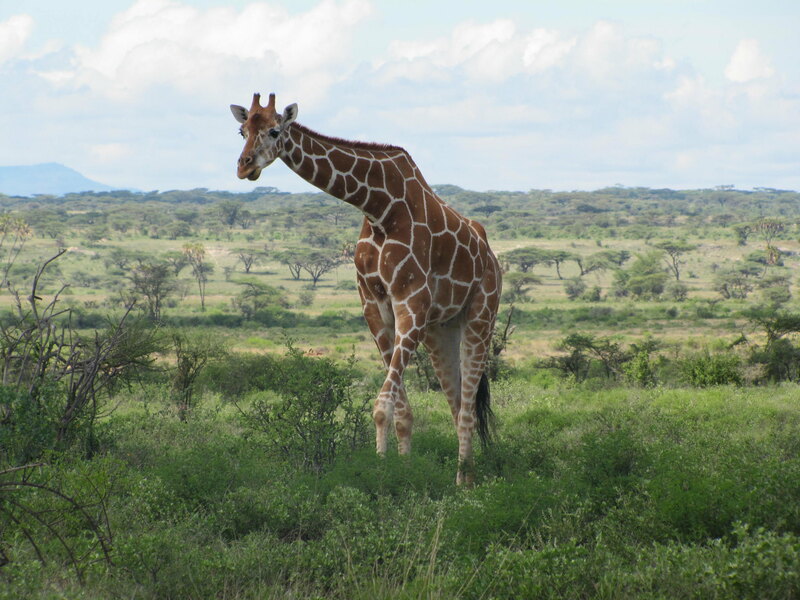 Photo taken on an Ujuzi safari to Kenya. With a mix of arid grassland, riverine forest and swamp, Samburu and Shaba offer opportunities to see many different kinds of wildlife, including elephants, reticulated giraffes, leopards, cheetahs, lions, Somali ostriches, hyenas, countless antelope and gazelle species, and more. In Shaba, small herds of fine-striped Grevy’s zebras – the largest and most endangered of the three zebra species – can often be found grazing in the sun or cooling off with refreshing dust baths. Both parks lie on the banks of the Ewaso Ng’iro (Nyiro) River, which flows through the middle of this area. Although its name means “muddy water” in the local language, it is a vital source of life for the resident animals and humans. Elephants and vervet monkeys play on its shady banks and crocodiles patrol the waters in search of suitable prey. 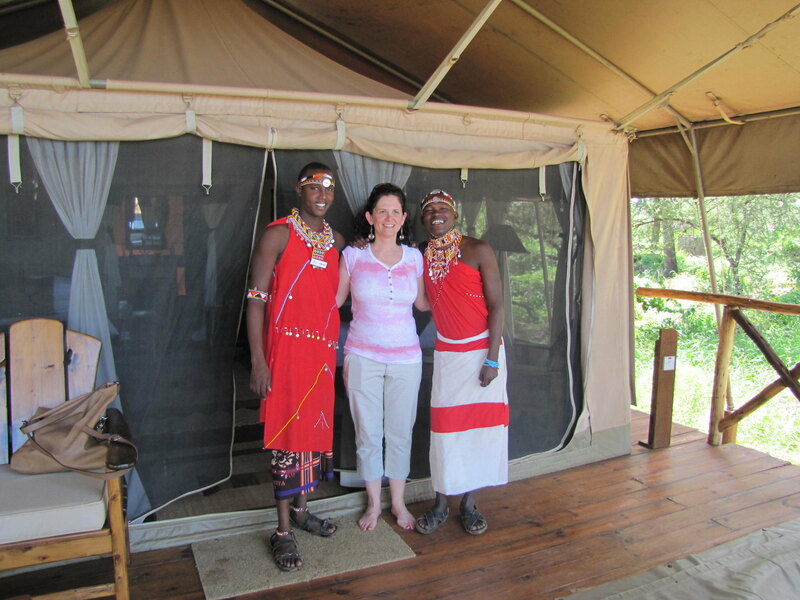 Ujuzi African Travel owner with Samburu staff at Elephant Bedroom tented camp in Samburu National Reserve. Traditional Samburu dress includes lots of red cloth and detailed beadwork. Several tented camps in Samburu offer visitors fresh air and close access to wildlife without sacrificing comfort. Most tents are permanent, having wooden floors that are raised off the ground; fully plumbed bathrooms with hot and cold water, showers, sinks and flush toilets; and outlets for charging cell phones and camera batteries. Shaba features a lodge with stone buildings, a large swimming pool, fish ponds and views of the river. Activities in the parks include game drives, bird watching, cultural activities and raft trips. 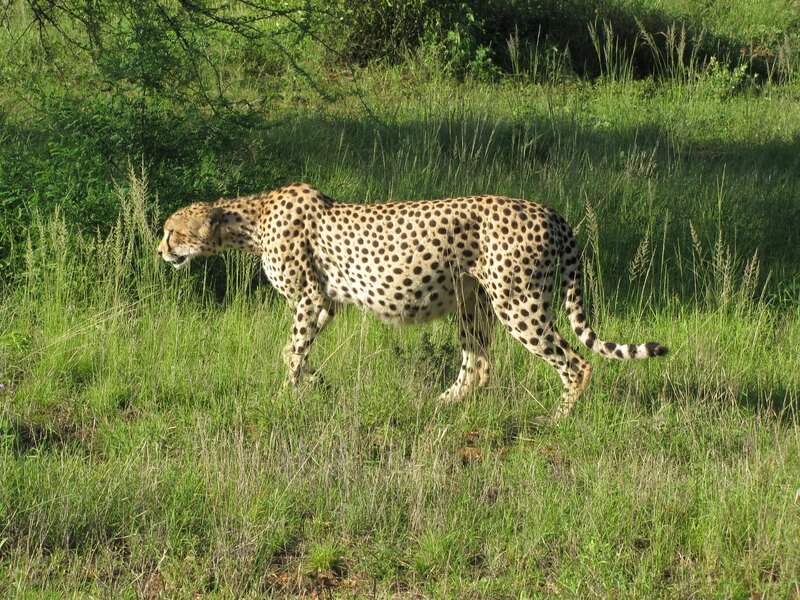 A male cheetah with a belly full of prey strolls through Samburu National Reserve. Photo taken on an Ujuzi safari in Kenya.